Steve Day describes himself as Britain's only deaf comedian, if there are any others he hasn't heard. Actually there are a couple of others who have started since he wrote that joke, but it's only a joke after all. For the past forteen years Steve has been performing to huge laughter around the country and abroad, well they tell him the laughter was huge to humour him, he doesn't know either way. 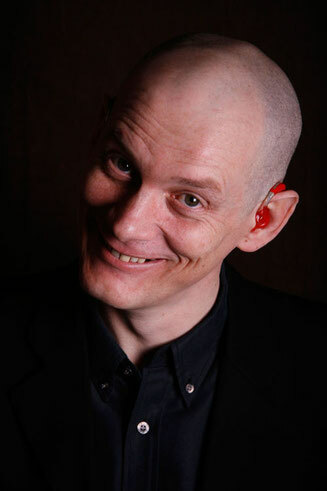 Married with five children, a fact nothing to do with not being able to hear the word 'No', Steve has been described as 'warm and witty' by the Scotsman and has received many other rave reviews whilst performing shows at the Edinburgh Fringe Festival. In March 2012 Steve was chosen out of 2000 applicants to be taken on by The BBC as a trainee presenter specialising in sport and comedy shows, part of The corporations Presentable search for new talent. In 2011 Steve returned to The Edinburgh fringe with Run, Deaf Boy, Run. A show about attempting to run The London Marathon. 'A hugely entertaining, cheerfully uplifting treat of a show' said Chortle.com, and The Scotman called it joyful, heart-warming, and funny. Both gave him four stars. It wasn't a fluke. Chortle.co.uk gave him five stars in 2007 for Deafy's Island Discs, a show The Sunday Times called 'Funny and Moving'. This show toured the UK in 2008, Steve's third national tour of the uk, and has been performed in several countries in Europe and translated into Italian. No-one knows why. A familiar voice on Radio 4, Steve has appeared many times on You and Yours, was a token man on Woman's Hour, has appeared in two radio dramas, All Fingers and Thumbs with Bill Nighy, whom he punched dramatically, and Sound Barriers with Patricia Routledge and Caroline Quentin, both of whom he was prevented from punching. A disabled performer, Steve is more concerned with success in the mainstream comedy circuit, but is happy to 'deaf it up' as necessary if the money is ok and there are sandwiches. Regular appearances and headline sets at comedy clubs across the UK. Sold-out solo performances in Copenhagen and Rome. Home Office, Foreign & Commonwealth Office, London School of Economics, EDS, Redhill Analysts, Thompson Holidays, Barclays Bank, Citizens' Advice Bureau, all major political party conferences, various Primary Care Trusts, numerous Disability and Equality events. TimeOut London, 27th June 2006. 'One in Seven' - writer. RNID, regular column since June 2005. 'Abnormally Funny People' - performer. Sky TV, January 2006. Outline Productions. 'The Sound Barrier' - performer (lead role). BBC Radio 4, Autumn 2005. Producer Sally Avens. 'You and Yours' - regular contributor. BBC Radio 4, various pieces since June 2005. 'No Triumph, No Tragedy' - subject of 30-minute feature. BBC Radio 4, February 2005. 'All Fingers And Thumbs' - performer. BBC Radio 4, December 2004. Above The Title Productions. 'Raspberry Ripple' (Pilot) - performer/writer. BBC Three, Spring 2004. Outline Productions. 'Natural Born Talent' - performer. Channel 4, 2003.